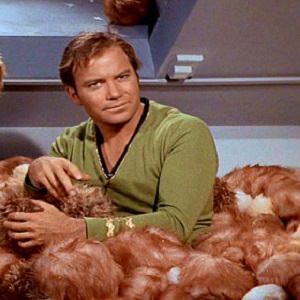 [Blind Gossip] The trouble with tribbles is that they seem so adorable at first. However, once you have had them for a while, they want to multiply. The trouble with beards is that they seem so adorable at first. However, once you have them for a while, they want to multiply their compensation. They didn’t become your beard because you are a lovely person and they enjoy spending all their time and energy on someone who will never be able to reciprocate. No, they do it because it’s a business arrangement. And once you start experiencing bigger success in your professional career, they want more. The beard to one major film actor is not demanding more. She wants her compensation doubled. She has put in the time and the commitment, and he’s doing well, so she wants more. He can afford it, but it does set rather a bad precedent. BG Note: Not James T. Kirk, who had Trouble With Tribbles, not beards. [Optional] Should he pay her or get out of the arrangement? Yeap, the Star Trek Captain Kirk reference. Totally Chris Pine. Chris Pine came to mind for me too but I think he’s single at the moment. No beard in sight. Applies to many but I guess Bradley Cooper is the one we’re looking for here. Is that baby even his? Get out…like literally come out already! Agreed. CHRIS PINE!. He uses a lot of face product. His face has a sheen. Given the Kirk and Star Trek reference, I will guess Chris PIne. His costar is unabashedly out of the closet, if he’s gay why is he hiding having supported Zachary Quinto? Wasn’t aware that Chris was ‘family’, but lots of others here seem to agree. Absolutely the beards should get more if the “bearded” is making more, the beard is what is making the bearded more money. What the heck, who’s stupid here. First one that came to mind was Zac Efron, but I don’t think he’s with his beard, Sami Miro, anymore. I honestly don’t care if someone is gay, bi- or straight. The other day I was having lunch with a group of friends and the topic of Prison Break coming back when someone in the group said, oh, I can’t watch that show anymore. It’s not the same since finding out that (hot guy) is gay. So I guess with that mentality out there, it is no wonder that most cannot be true to themselves as their career will likely take a hit. Good points. I don’t care either if a performer/actor/actress/ public figure is gay. With acting it’s just role playing (tho some fans get confused ; ). Its ironic an industry that publicly fights for equal/ LGBT rights but continues to force/ coerce many to lie about who they are. BIG closet. It’s getting better. Well, it’s sad but true. Actually most of the gay guys in Hollywood ping, so they don’t ring true as a love interest. Ironic. The similar blind suggests Bradley Cooper, but the Star Trek clue makes me think Chris. Who is Chris Pine dating right now? I remember reading something about him and some reality star, but I thought that was a couple of years ago. If having a hetero image is part of his bankability, she should get paid more as he gets more. Seems fair. I’m guessing Leo DiCaprio or Bradley Cooper. Although, I think both are straight and don’t need beards. Bradley Cooper and his pregnant gf ??? who knows….. If he is not happy get out and get another…..
Pay her. I don’t feel sorry for these men or women who want to portray themselves as straight to continue to make money, hire beards and then the beards demand more money. You indulged in this being your ‘accepted’ lifestyle so pay for it. Could this be Chris Pine due to the Captain Kirk reference? Just a guess. She has put time into this relationship and is even supposedly pregnant with his baby. That’s dedication, and probably deserving of a raise. The blind mentions multiplying, and she’s going forth and multiplying, it appears. The tribbles are multiplying because Irina Shayk is carrying his baby (supposedly his) and the beautiful Russian justifiably wants adequate compensation for her and the baby. Pay up baby daddy Bradley. Give the nice Russian lady beard what’s owed. Love the pic you used. Optional: Pay. Both of them are 100% gay. I will never understand why so many people think Bradley is gay. Where is the proof? If you listen to what he has said about women and what people(friends, co-stars,etc.) who actually know him have said about him and women, nothing adds up to him being gay. Get out of the arrangement. I mean, isn’t the answer always Bradley Cooper? I don’t know but LOL at the Star Trek/tribbles mention, as well as the reference to Captain James Tiberius Kirk! I would be broken hearted if he needed a beard, as he was my hero and was so HOT back in the day! Live long and prosper, Captain Kirk/Bill Shatner. LOL Read this after my comment below. Looks like us Trekkies (sp?) are here. Capt JT Kirk was hot but/ and I was won over by Sir Patrick Stewart. Still am. Just want to hug him! If the contract is ending and its time to renew, of course it makes sense to ask for more. But if she is asking for the existing contract to be broken, then no, that is too bad! Things could have worked out in the opposite way, in that he became less busy, yet would still be bound by what the contract stipulates. As a former Trekki thx for making my day. The original was the best but Sir Patrick Stewart is amazing.